Hyderabad: Indywood, a 10 billion US dollar project which aims at elevating Indian film industry to a global platform, has honoured prominent Telugu journalists from print, visual, online and radio media by conferring prestigious Indywood Media Excellence Awards for their valuable contributions and constant efforts to uplift film and media industry. Allam Narayana, Chairman, Telangana State Press Academy inaugurated the function held at Hotel Plaza near Begumpet on Wednesday. The prestigious Lifetime Achievement Awards were awarded to A.V. N. H. S. Sarma (Eenadu), Khaja Quayum Anwar (T News), Anandam Pulipalupula (Visalaandhra) and Jayadeva Rentala (Andhrajyothi). Special recognition was awarded to K Nageswara Rao (UNI), Subbarao Nagabhiru (Andhrajyothi), Rambabu Varma Lanka (Telugu360.com), G Anand Kumar (ETV Cinema), Jalapathi Gudelli (TV 9), P. V. Ramana Kumar (Mahaa News), Ramesh Chandu (Boxoffice Cinema), Krishna Kambalapally (TNN News), A. Raja Babu (Oneindia.com), R S J Thomas (Photo Journalist), P. R. K. Prasad (Andhraprabha), Kranthi Kiran (TV 1), U Srinivas (Greattelangaana.com), Munnaluru Maruti Prasad (CNN News), JBS Umanadh (Deccan Herald) and U. Vinayaka Rao (Andhrajyothi). 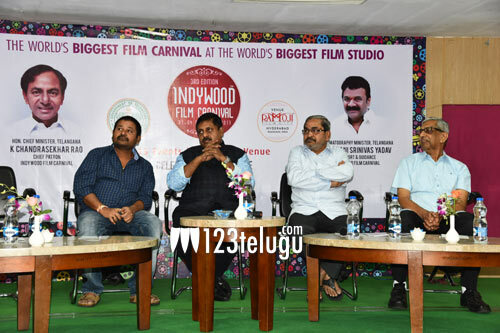 While addressing the media, Indywood Film Carnival Founder Director Sohan Roy announced that 3 rd edition of Indywood Film Carnival 2017, one of the largest film-based events in the country, will be held at Ramoji Film City, Hyderabad, from December 1 – 4, 2017. Parvathaneni Rambabu (Cinejosh), Duddi Sreenu (Filmytollywood.com), Ramakrishna.S (Eenadu), Phani Kandukuri (NTV), Y. J. Rambabu (TV5 News), D.V. K. Vasudevan (Bol Hyderabad), Nageswararao Somisetti (Sakshi TV), K. Satya Rama Krishna (10 TV News), Ramesh Chinnamula (Zee Cinemalu), M. Chandra Shekar (T News), Suzen Vallabhaneni (Studio News), Sai Sandeep (Times of India), Pavan Survi (www.survi.in), Sandeep Iragavarapu (www.telugucinemas.in), Hemanth Kumar CR (Freelance journalist), Rajkamal (Filmybuzz.com), Nagireddy B (123telugu.com), Vrinda Prasad (Zee Cinemalu), R Krishna Prasad (6 TV News), Vijayanand Keetha (idreampost.com), Srinivasa Rawlo (telugumirchi.com), MHD Parvaiz (Bharat Samachar News Agency), Ratna G Chotrani (PTI and Siasat), Nikhila Henry (The Hindu), V. Durgamba (Andhra Prabha), Rachana Mudumbi (Namasthe Telangana), Amrita Didyala (Times of India), Sathish Dhandaveni (ETV), Ashish.Kumar Pandey (India Today/AAJ Tak), A.S. Joel Kumar (Sakshi TV), AV Madhu (Andhrajyothi), Surekha Abburi (Sahara Samay), Venkata Sriram J (SwayamPrabha), K. Narahari (SK Vartha), K Suresh (V6 Channel), T.V. Kiranmai (Andhrajyothi), E. Venkateswarlu (HM TV), Reddy Hanumanth Rao (Nava Telangana) and K. Rama Narayana Raju (Andhraprabha).